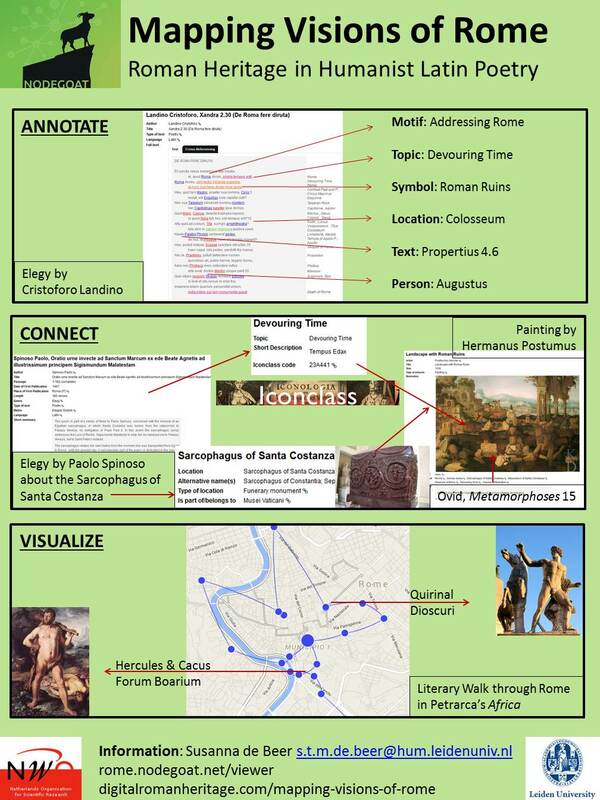 The main goal of this project, which is designed in the research environment Nodegoat, is to make available a collection of (Renaissance) Latin poetry related to the city and symbol of Rome, and to offer tools to analyze these texts individually or comparatively and map them on various literary, geographical and chronological axes. This environment shares, annotates and visualizes the primary sources in order to enable navigation through the material from different perspectives. It does so by combining theoretical insights from reception studies with resources and tools from Digital Humanities, and developing them further to meet the challenges of the complexity and hermeneutics of humanities research. This means that this environment enables the researcher to annotate in the primary sources the elements of the Roman legacy – 1. persons, 2. monuments, 3. events from history and myth, 4. topics, 5. symbols and 6. narrative motifs – that are selected and appropriated in a new context. Moreover, it includes information about the primary sources and their makers that place them in a specific historical and artistic context. The navigation through the material from different perspectives allows you to trace, among other things, a specific monument, narrative motif or person throughout the dataset, identify works that have been made within the same patronage network, or look for chronological or geographical trends. By this means you can create a corpus for further analysis that was not determined beforehand. In addition the Latin full-text can also be searched, and in the future hopefully be analyzed for intertextual relationships by a tool like Tesserae. The innovation of this database is in the way it integrates metadata about texts (and their authors) with metadata retrieved from the texts (= tags) with the full-texts themselves. However, the various data and dimensions it consists of are in themselves not new in the field of Digital Humanities. Thus, in order to make this database useful not only for the analysis of Latin poetry about Rome, but also for interdisciplinary research with regard to the city and symbol of Rome, it is crucial that elements in the texts and metadata are identified in a uniform way, so that they can be linked to or integrated in (digital projects in) related areas, like archaeology, history, art-history. This means, among other things, that it adopts standards for the description of the various elements that are included, according to existing DH initiatives in this field: e.g. for monuments use the ID’s from www.census.de, or topics from www.speculum.lib.uchicago.edu, and www.hadrianus.it. Connections can also be found on the level of persons, topics and narrative motifs, by adopting the standard classification system for iconography (www.iconclass.org). If standards do not exist, the goal is to develop these with other scholars from the Digital Roman Heritage network. Designing and developing this project is part of my VENI research (Visions of Rome. Strategic Appropriation of the Roman Heritage in Humanist Latin Poetry) and NIAS fellowship (Mapping Humanist Visions of Rome. Sharing and Visualizing Poetic Appropriations of the Roman Physical and Literary Heritage).